Native to various parts of Asia, including India and Java, the peafowl are beautiful birds. Peafowl and the majestic peacock come in two breeds available to the backyard poultry enthusiasts for raising. This gives backyard bird lovers an astounding array of colors to choose from. 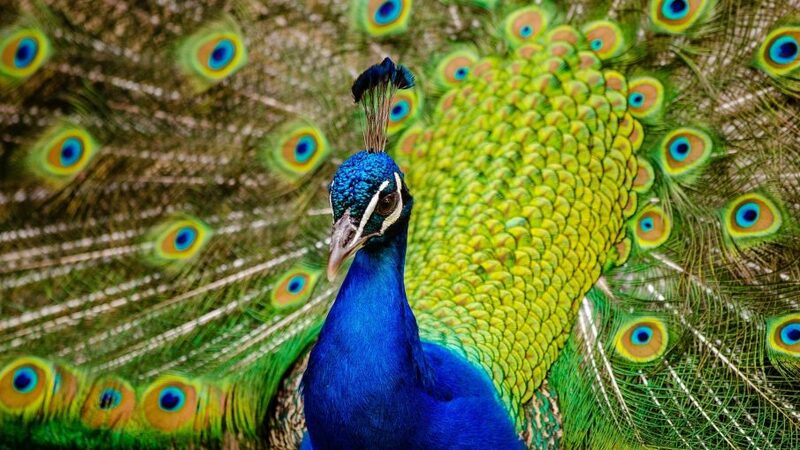 The most common breeds of peafowl that people envision when they think of peafowl breeds is the green peafowl and the Indian blue peafowl. The latter is the most popular type of peafowl, and its blue peacock is the bird most commonly encountered in zoos. Lewis Wright (The Practical Poultry Keeper: Public Domain) says: The distinguishing characteristics of this well- known bird, are the crest or aigrette on the top of the head, and the peculiar structure of the tail covert feathers. The true tail of the peacock is short and hidden, and what we call the “tail” is, strictly speaking, an excessive development of the tail-coverts or side feathers, which occasionally have been known to extend more than a yard and a half from their insertions. Varities of Peafowl: The colour of the ordinary peacock is too well known to need description. White and pied varieties are also bred, but are, in our judgment, far less ornamental. This species, called by naturalists Pavo cristatus, has a crest consisting of about two dozen feathers, only webbed at the very tips. There is another variety, if possible still more beautiful, known as the Javan Peafowl, or Pavo muticus. This bird is larger than the common Peafowl, the male sometimes measur- ing more than seven feet from the bill to the end of the “tail.” The naked space round the eye is also of a livid blue colour, and the feathers of the neck are laminated, or resembling scales. The most characteristic difference, however, is in the crest, which is much higher, and the feathers of which are webbed, though rather scantily, from the base, instead of being bare till near the tips. The bird also differs in only possessing liis long and splendid ocellated train during the breeding season, at other times appearing with feathers not so long, and destitute of the well-known ” eyes,” but of a rich green with gold reflections, beautifully and regularly ” barred,” or ” pencilled ” on a very large scale, with whity-brown. This splendid bird is not very common. A third variety has recently been described, called the ” black- winged ” Peafowl, in which the shoulders and most of the wing in the male bird are black. The hen is much lighter than the common breed, being generally of a cream colour, with a dark back. It appears a distinct race ; but it must be ad- mitted that all three varieties of Pea-fowl freely intermix with a fertile result, and so closely resemble each other in nearly all their characteristics that a common origin is not at all unlikely. Our easy-to-read, comprehensive poultry guides will show you everything you must know about raising peacocks and raising peahens.